Cheesy Sausage Stuffed Mushrooms filled with a cream cheese sausage mixture you’ll swoon over. 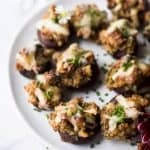 These Stuffed Mushrooms will be the star of the appetizer table this holiday season! Heat a large saute pan to medium high heat. Add grape seed oil and shallots. Sauté until translucent, about 2-3 minutes. Add in garlic. Sauté for 30 seconds, stirring the entire time. Add in chopped up mushrooms stems. Saute for 3 minutes, stirring throughout. Next, to the pan add in sausage. Sauté until sauté is browned, about 5-6 minutes, breaking up sausage into small pieces with a wooden spoon the entire time. Once sausage is browned add in oregano, parsley and fresh spinach. Stir to mix and saute until spinach is wilted down. Remove from heat. Add sausage mixture to a small bowl along with cream cheese. Using a spatula mix everything together. Set aside. On a baking sheet, line up prepared mushrooms (with the hole facing up). Bake for 40 minutes, until slightly browned. Remove from oven top each mushrooms with tiny amounts of mozzarella cheese.